For most people, the holiday season is a time filled with joy and holiday cheer. It’s a time we look forward to all year to spend quality time with our loved ones. But along with cheer, the season can bring hazards to seniors and homecare patients. This year, if you’re celebrating with a senior loved one consider these tips to keep them safe. Keep pathways throughout the house free from clutter and décor. Make sure Christmas lights and extension cords are either taped down or placed under rugs. When hanging decorations, ensure they are hung high overhead to avoid entangling or disorienting your loved one. According to the National Fire Protection Association, there is an estimated 210 home structure fires per year that begin with Christmas trees. With fires initiating from Christmas trees being four times more likely to be fatal. To protect you and your loved one, here are a few tips on ways to keep them safe from tree fires. Opt for cool burning LED tree lights instead of the warmer-burning traditional lights. Inspect each set of lights whether they are new or old for broken/cracked sockets and frayed or worn wires. Always use candles away from flammable décor and never use to decorate a Christmas tree. If using a live Christmas tree, make sure to check the water every day and add water when needed. Make sure all smoke detectors in the home are in working order. It’s important for seniors to stay active all year long. However, winter weather can make going outside potentially dangerous and drop temperatures inside. Seniors are at an increased risk for falls or injury in cold weather due to slippery, wet and unstable surfaces. 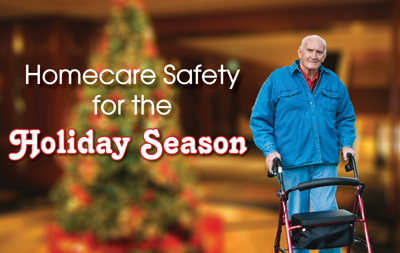 Consider these tips to help keep your loved one safe and fall-free this holiday season. Proper footwear is essential when heading out into the elements. Make sure your loved one has a good lightweight winter shoe. Opt for a waterproof shoe with a non-slip tread made of natural rubber. A cane or a walker should be used to help provide support on slippery pathways. An ice gripper can be added to the tip of the cane to provide traction on icy surfaces. Make sure your loved one stays warm inside by keeping the thermostat at a minimum of 70 degrees. A heated throw is a perfect gift to help ensure they stay warm on those cold days. When it’s too cold to venture outside, check out these exercises that your loved one can do indoors all year around. While celebrating this holiday season, you may realize your loved one could benefit from added help around the house. Assisted Caregiver Services can offer support with tasks from Shopping and Errands to Assistance with Personal Hygiene. To learn more , please visit www.assisted1.com or call 800-494-6555.